Brooksby Melton College Student Wins Horticulture Award from Leicestershire and Rutland Gardens Trust! 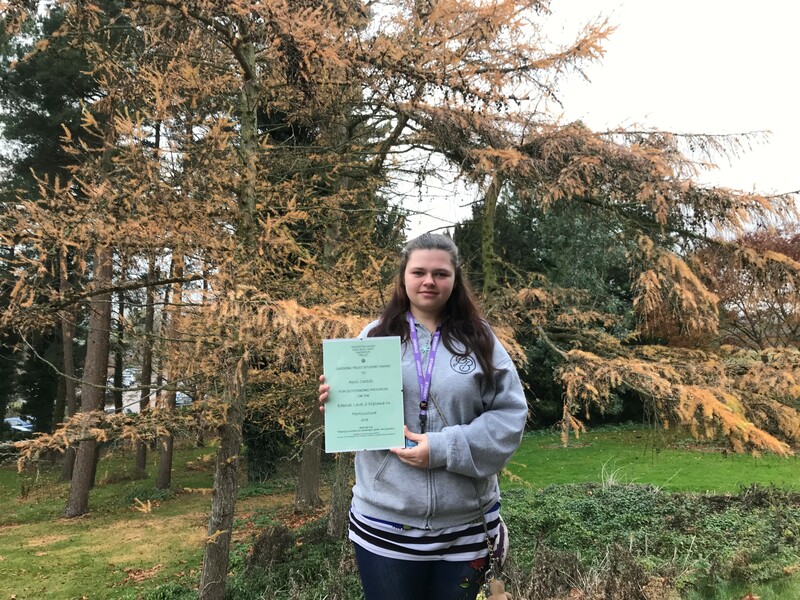 Brooksby Melton College student April Castell (18) was recently presented with the Brooksby Horticulture Award; an annual prize awarded by the Leicestershire and Rutland Gardens Trust. April, who progressed from Level 2 Horticulture to Level 3 Countryside Management in September, was chosen for this award because of the outstanding progress and dedication that she has demonstrated throughout her Horticultural studies. The Leicestershire and Rutland Gardens Trust presents this award to a deserving BMC student each academic year, alongside a cheque worth £100 to go towards books and equipment to aid their studies. April said ‘Honestly, I was completely shocked when I found out that I had won the award! It was amazing and my friends and family were so proud of me. I have worked so hard over the past couple of years so it’s really nice to have my hard work recognised! The money that I received with the award has also been really helpful – I have bought some new overalls, a notebook, a project folder, a travel mug and some new pens. ‘I have always loved gardening, and it is something that my Grandma and Grandad were really passionate about. Both of my grandparents died when I was quite young, so studying Horticulture and Countryside Management has helped me to feel closer to them and has given me the opportunity to follow in their footsteps. ‘Even though BMC isn’t my most local college, I chose to study here because I had heard so many great things and I knew that it was a great place for Horticulture courses. As soon as I had been to my interview and seen the college, I knew that BMC was definitely the college for me. In the future, I am hoping that my qualifications will help me to achieve my dream of owning my own garden centre or becoming a landscape gardener.